It has been more than 10 years that WordPress is with us and it has completely revolutionized the way of online content publishing. From its birth in 2003 by founder Matt Mullenweg, WordPress has constantly grown as a powerful online publishing tool and have reigned over the entire blogging world like a king. WordPress is always a free and Open Source Content Management System (CMS) which is used by many popular sites to manage their content and have been downloaded over 30 million times. If you have been with WordPress then you should probably know how it has evolved over time, but only a handful of people have been with it since its inception and have witnessed its complete evolution. So, in this article we are going to take you on a journey from the birth of WordPress, as a simple online publishing tool to express your thoughts online to one of the most powerful Content Management System that it is now. 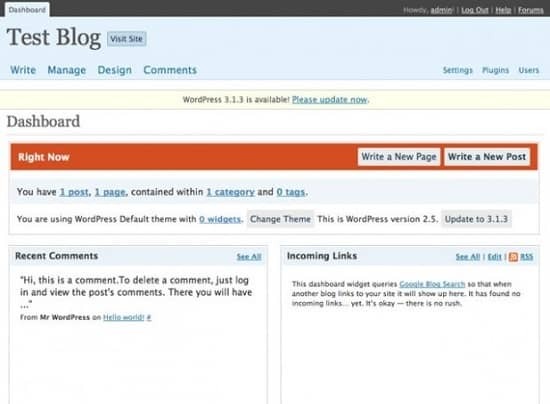 So, get ready to witness the evolution of WordPress over a long span of 10 years from 2003 till today. 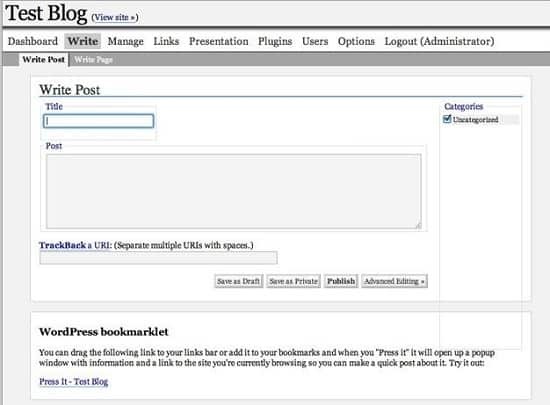 This was the first version of WordPress after 0.6, which was officially available to be downloaded from the WordPress Release Archive Page. It didn’t have much functionality and mainly focused on simplicity. There was no Dashboard and the landing page of the admin panel was directly the post page. The post page was also pretty simple where you could “Publish”, “Draft” or make a post’s “Private”. It was a nifty feature which appeared for the very first time on WordPress and allowed writers to write a post, save it as a draft, make some revisions later and finally publish it. It also had some serious limitations like the incapability of assigning multiple categories to a single post. This was the first major release of WordPress which was named after a famous jazz musician, Miles Davis. It had some minor improvements on the UI and had also resolved the limitation of assigning multiple categories to a single post. It also kept in mind the optimization needed for search engines thereby allowing the creation of search engine friendly permalinks. This update was a great release which added the “Plugins” section to the admin panel. Plugins are something which can allow you to expand the functionality of your WordPress site without requiring you to touch a single line of code. There were some other useful feature additions which are present till date – thumbnail creation, post preview, sub-categories, encrypted passwords and much more. 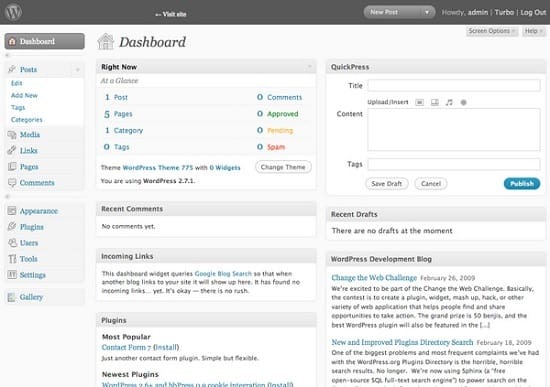 Another update to WordPress, which brought our very own “Dashboard” to the admin panel. 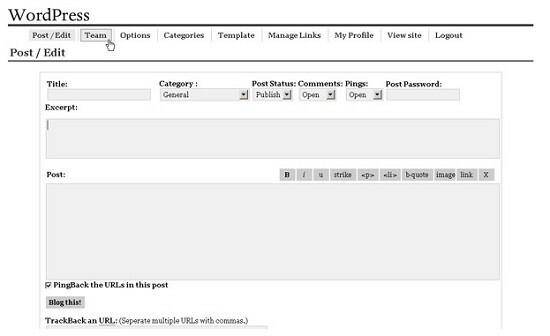 Now after logging in, the users are taken to the dashboard instead of the post page directly. 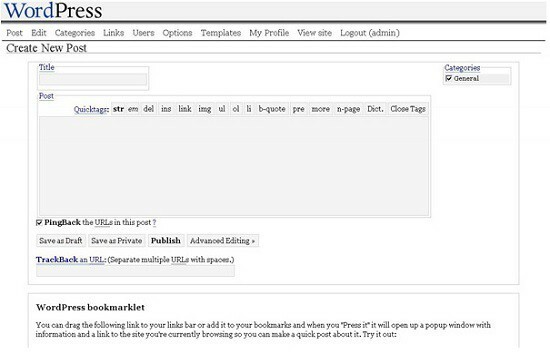 The developers also understood the importance of creating pages and added the “Write Page” option too. We had a tabbed interface for the first time which was missing in the other predecessors. It also added multiple theme support where each theme had a separate header.php, footer.php, sidebar.php which could be easily edited anytime for the theme to be changed instantly. But the UI was not powered by AJAX, so it was slower than what we see and experience now, but further improvements were inevitable. The UI of the admin panel had a major overhaul in this update. Finally it got a touch of some shades of blue from its monotonous white and gray combination, giving it a rich and fresh look and feel. For the first time we get introduced to WYSIWYG editor in WordPress where the advanced TinyMCE editor allows rich formatting of your posts. Another great addition was the ability to upload images to enrich the posts and pages even more. The themes could also be previewed before applying via the “screenshot.png” file. The entire admin panel got a taste of AJAX from its roots, thereby making each and every action fast and fluid. Not only did it save the loading time of your admin panel, but also a lot of precious bandwidth by avoiding unnecessary reloading when small elements of a page got updated. You could also customize your entire workspace by dragging and dropping elements just the way you want. Previously, we also had the 2.2 and the 2.4 which were minor updates adding features like widget support, better notification about updates, and some security updates, etc. But the developers skipped the 2.4 and jumped directly to 2.5 so obviously it was going to be a major update. The UI got a major update and started looking clean and fresh much like the way it looks now. Things were almost placed the way we see now and it was obviously one of the best looking UI update of WordPress till then. The Dashboard also got more informative and also had options to update the plugins in a single click of a button directly from the plugins directory. Not only that, the File Uploader also got a major update with the ability to upload multiple files at once. We also got a progress bar to track the possible amount of time that the file could take. 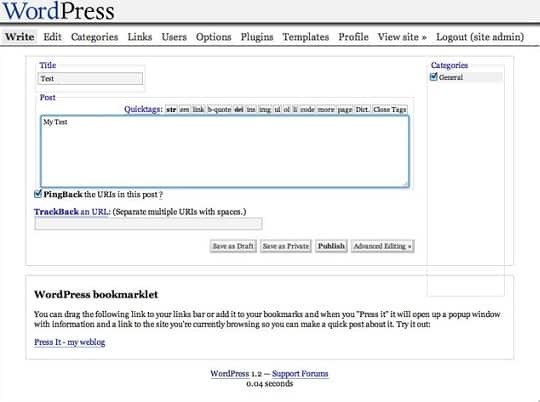 This was the WordPress which is very close to what we have now. It was the WordPress which had reached millions of users. The main admin panel again got an UI update with a collapsible sidebar with various options to control your entire site. There were a variety of available tools in the sidebar which were categorized into various sections like Posts, Pages, Comments, Media, Plugins, Themes, etc. The Dashboard had a “Quick Press” option which made posting super quick. It also got updates to the comments section with the ability to reply to comments from the admit panel itself and the support for threaded comments too. Previously we had 3.0 and 3.1 update adding the support of multi-site functionality in WordPress, a default theme named “Twenty Ten”, a sticky Admin Bar on top of all posts and pages of your blog and much more. But WordPress was becoming more and more popular day-by-day. 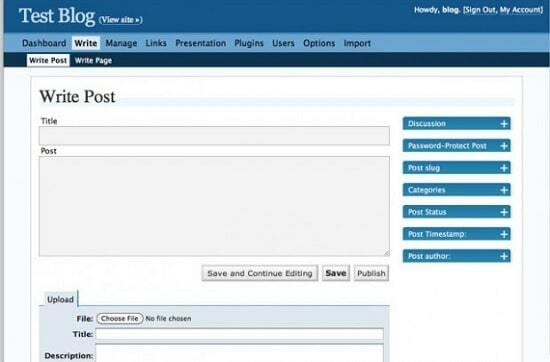 More and more users were jumping into WordPress and trying their hands on this powerful CMS. The WordPress development community was also not sitting back and to keep the pace running they released the 3.2 update with the main aim of making WordPress faster and light-weight. Another cool feature addition to WordPress was the “Fullscreen Editor” which provides a distraction-free writing experience for the writers. Later the 3.3 minor update also got released to make WordPress compatibility better with the tablet computers. This update introduces very little improvement in terms UI or performance, but brings a major improvement in the image workflow in WordPress. The new “Media Manager” gets a completely new look and presents an efficient way of managing all your media content easily. It also adds support for the Apple’s Retina display so that no matter how large your screen resolution is, the admin panel would just fit in perfectly. We also got a new color picker and a new theme “Twenty Twelve”. There are many new improvements which have been introduced from this new update, but the thing that is worth mentioning this time is, automatic background updates. You don’t need to click a single button to apply the new security and maintenance updates. Everything happens automatically and in an even more secured manner. WordPress also improves their password meter and ensures that you create a stronger password than before as it is the first line of defense of your website. Moreover, this update allows WordPress to automatically update the language files which is a boon for the users using WordPress in languages other than English. The journey of WordPress evolution ends here with the current WordPress version being 3.7. But the development will probably never stop. 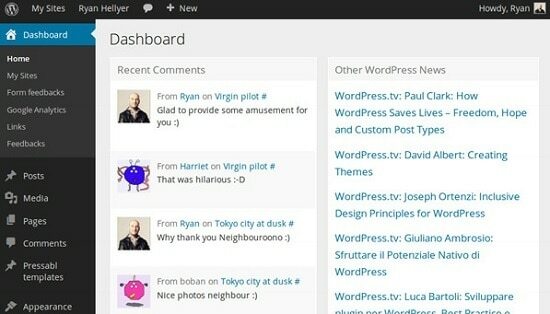 We are going to have many updates which are going to make our lives a lot easier with WordPress. The next release of WordPress 3.8 is due in December this year, which will bring some more improvements and features to WordPress. 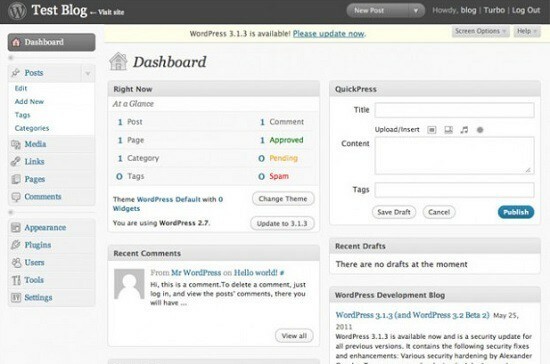 There has also been a long rumor that WordPress is going to change the UI completely and is planning to adapt a completely new look in its near future updates as there have been no major UI update for a long time. This entry was posted in WordPress and tagged wordpress, Wordpress Evolution, Wordpress History, Wordpress UI Updates on November 13, 2013 by Aritra Roy.